I think Turin is one of my new favorite cities in Italy… We only had a day to spend here but were able to see and do so much in just a short period of time, mainly because our hotel – NH Santo Stefano – was perfectly situated in the city. 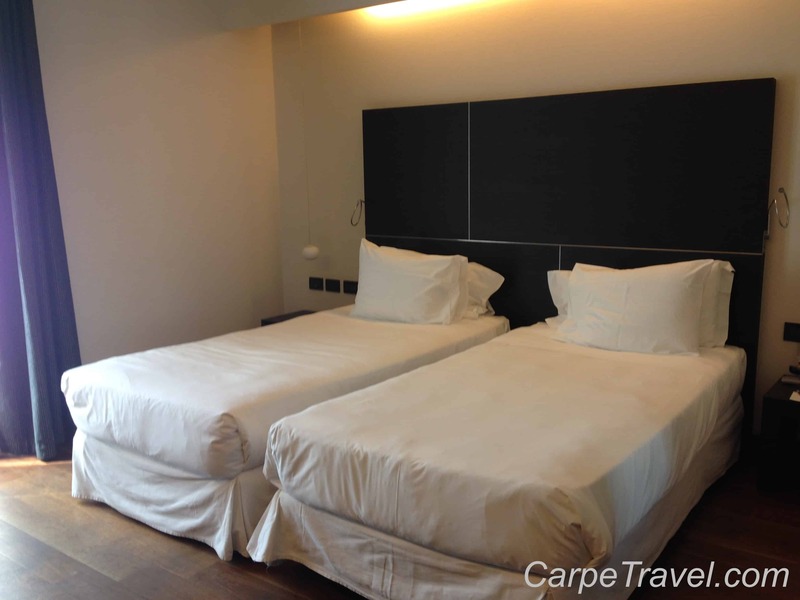 If you’re heading to Turin and looking for a hotel, make sure to read this review. NH Santo Stefano is a few blocks from Piazza Castello and a short walk (two blocks) to the Dumo and the Cathedral where The Shroud of Turin is kept. (I highly suggest you stop in to see The Shroud of Turin, it’s pretty interesting.) As for shopping it’s a few blocks off of Via Roma, known for great shopping in the area. There are a variety of guest rooms at NH Santo Stefano, pricing varies (by a few euros) depending on your room selection. Note, few if any rooms offer king and queen sized beds. Most options include a double and/or two twin beds. We opted for two twin beds and I was pleasantly surprised to see they had them arranged more as a king sized bed. Note, the beds do have wheels so you can easily move them together or separate them. The bedroom itself was a good size – big enough for the two beds, nightstands and a desk that lined the back wall. It also had a window that opened into the courtyard. There are rooms facing the city street but I would think the interior rooms would be quieter. The bathroom is very large with an over-sized bathtub/shower. 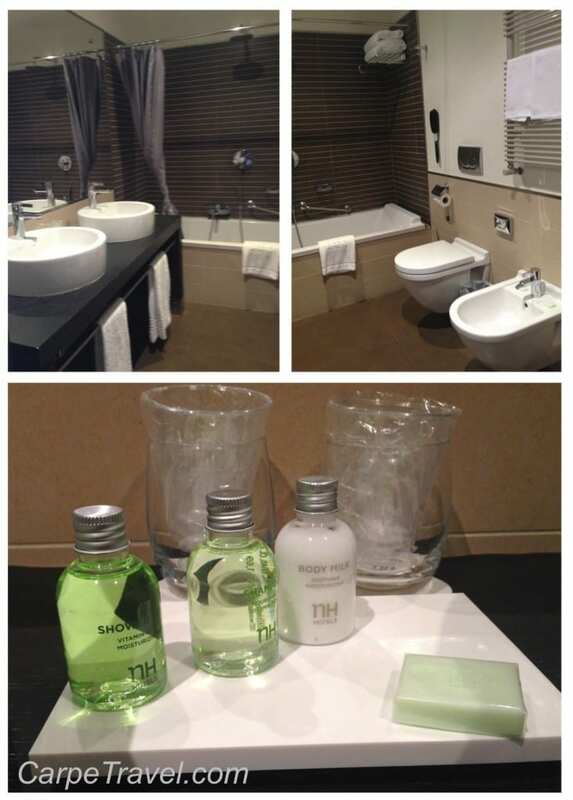 Both the bedroom and bathroom were extremely clean and complete with plush, white linens. Dining: The NH Santo Stefano has an onsite restaurant with both indoor and outdoor seating. I have to admit, I loved the outdoor courtyard. 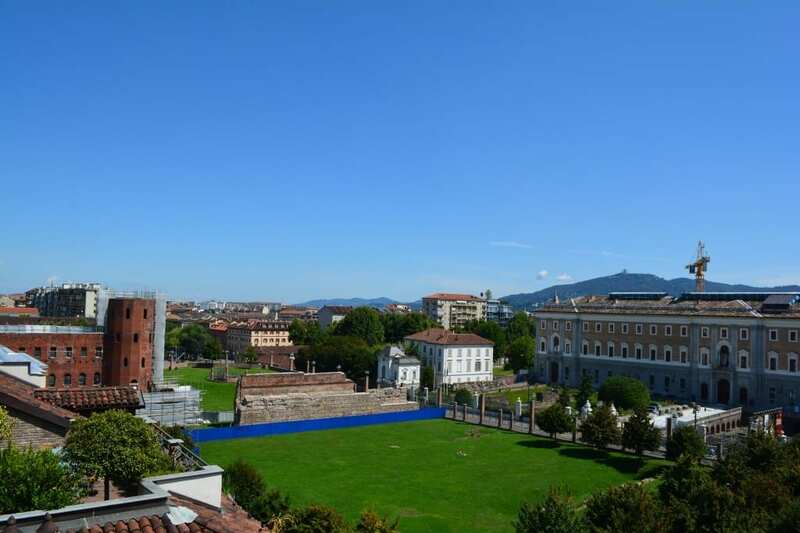 Filled with modern seating, surrounded by views of old Italian Baroque buildings. It’s a very peaceful setting to enjoy a meal, an amazing cheese board or just a glass of wine. The restaurant serves breakfast, lunch and dinner. Breakfast is complementary. If you’re not in the mood for a meal but need a drink and/or small plate the NH Santo Stefano has a separate bar area as well. 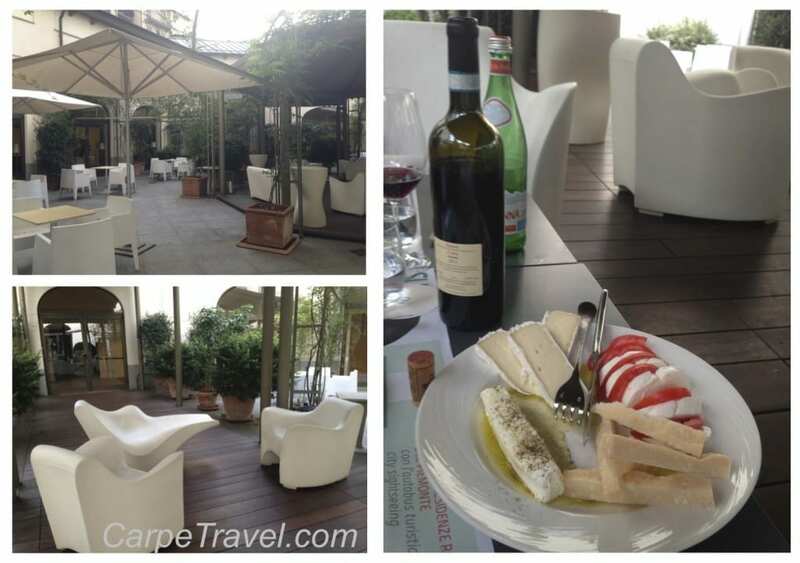 We chose to enjoy our wine and cheese in the outdoor courtyard BUT the inside bar is very warm and welcoming. The walls are lined with floor to ceiling bookshelves and a grand piano sits in the back just waiting for someone to bust out “Piano Man”. Rates: Aprox 150 euros. Note: If you have an American Express Card check with the AMEX travel to use your points for a discount. We were able to book our room this route. 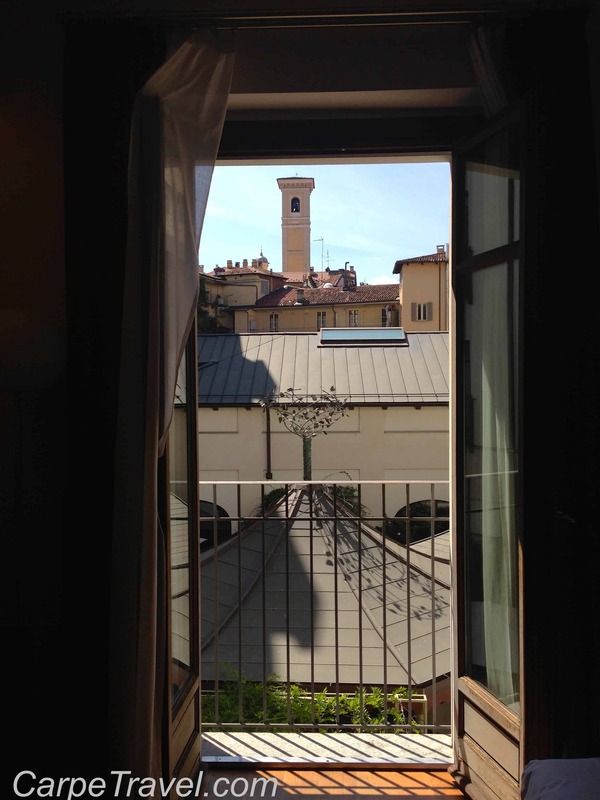 Bottom Line: NH Santo Stefano is a fabulous hotel in an excellent location for those wishing to see Turin. While the location was perfect for us, the room, courtyard and onsite dining made our stay one we’ll remember. 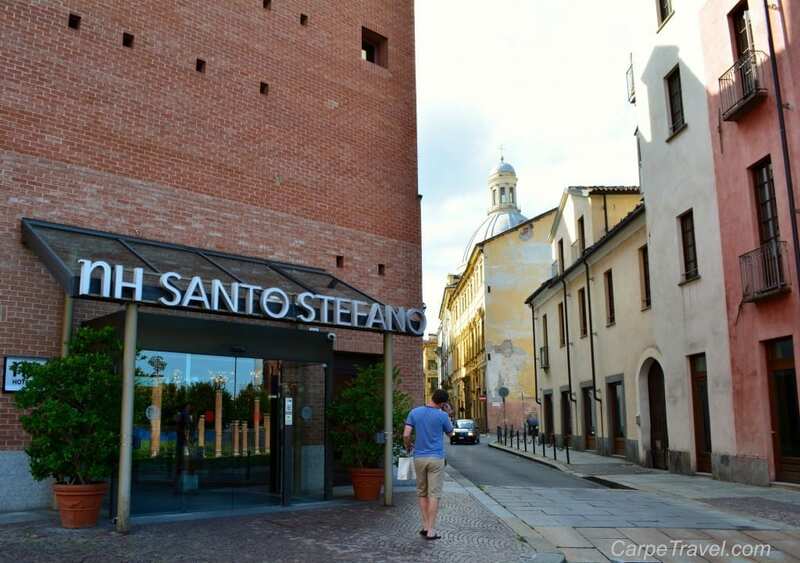 If we head back to Turin, we will be visiting NH Santo Stefano again. Have you stayed at NH Santo Stefano? What did you think? Love NH hotels. 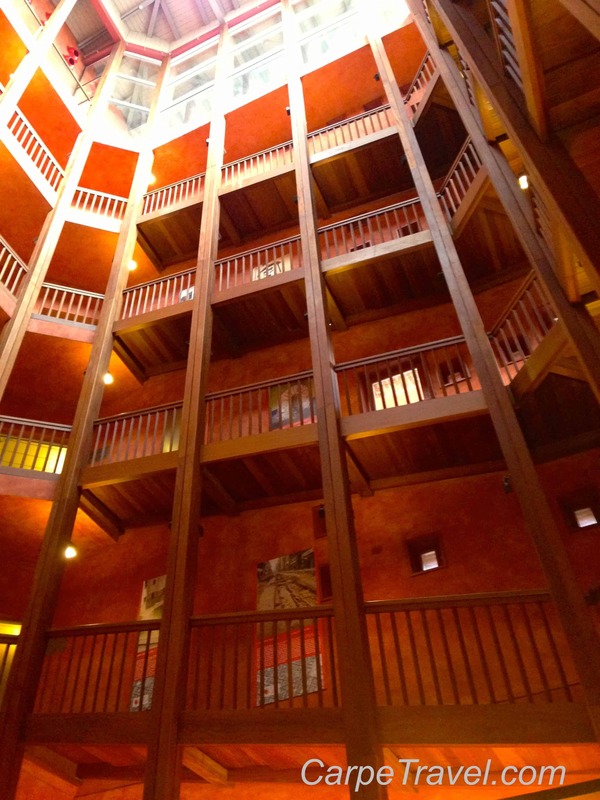 I’ve stayed several times at the one in Nuremberg, Germany and it’s always fantastic! Ah, Italy. How I missed you!